Our Thanksgiving Preschool Package gets your classroom completely organized with activities for Circle TIme, Song Time, Language Arts, Reading, Math, Sensory, Arts and Crafts, Gross Motor / Games, Fine Motor Skills, Snacktime, Practical Life Skills Practice, Social Emotional Learning / Character-Building Activities, and Social Studies too! This Thanksgiving Preschool Package uses the theme of Thanksgiving to teach a variety of early learning skills covering all subject areas for a week. 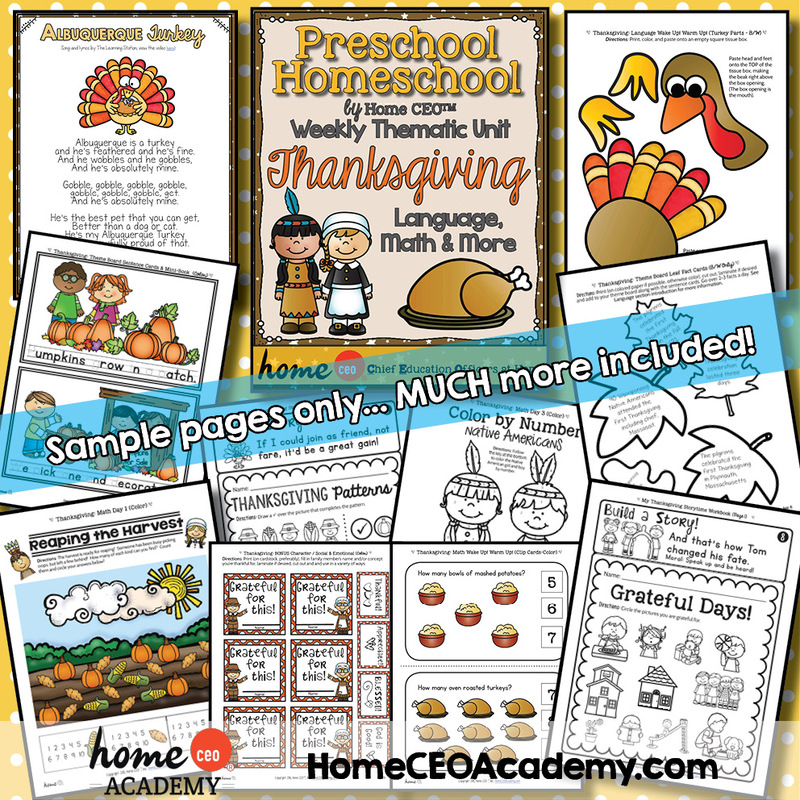 You'll receive 200+ pages of preschool Thanksgiving fun and 100+ pages our bonus classroom organization systems. This is a complete two weeks of printable activities for Age 2-4 using the theme of Thanksgiving to teach a variety of early learning skills. The skills follow the weekly progression of our complete year program, but it can be used as a standalone unit as well. 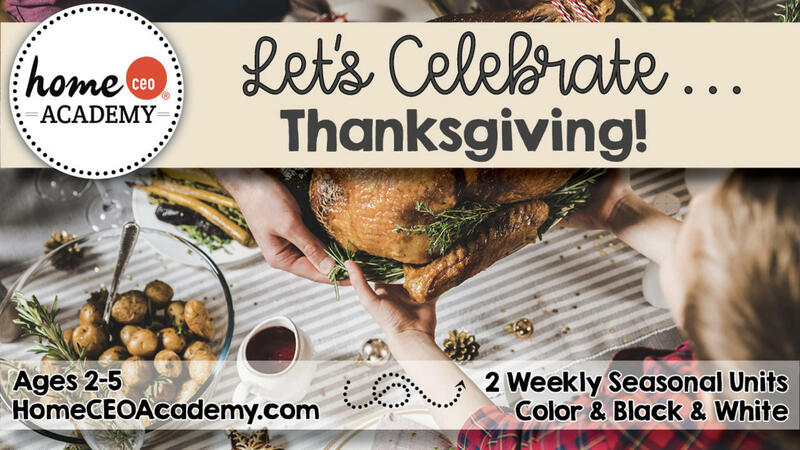 Not only do you receive our complete Thanksgiving unit, but you will also recieve our comprehensive classroom setup package, a $15 value, free! Message us at any time. We'd love to answer any questions you have. Home CEO Academy is a social enterprise! All profits from our store are distributed to over 20 charitable nonprofit organizations fighting for justice, education and the alleviation of poverty and disease, so thank you for your purchase! It has gone to building a playground for 415 children in Uganda, providing college and primary school scholarships, providing water for 180 people for life and more! Learn more about how we serve on our About Us page. 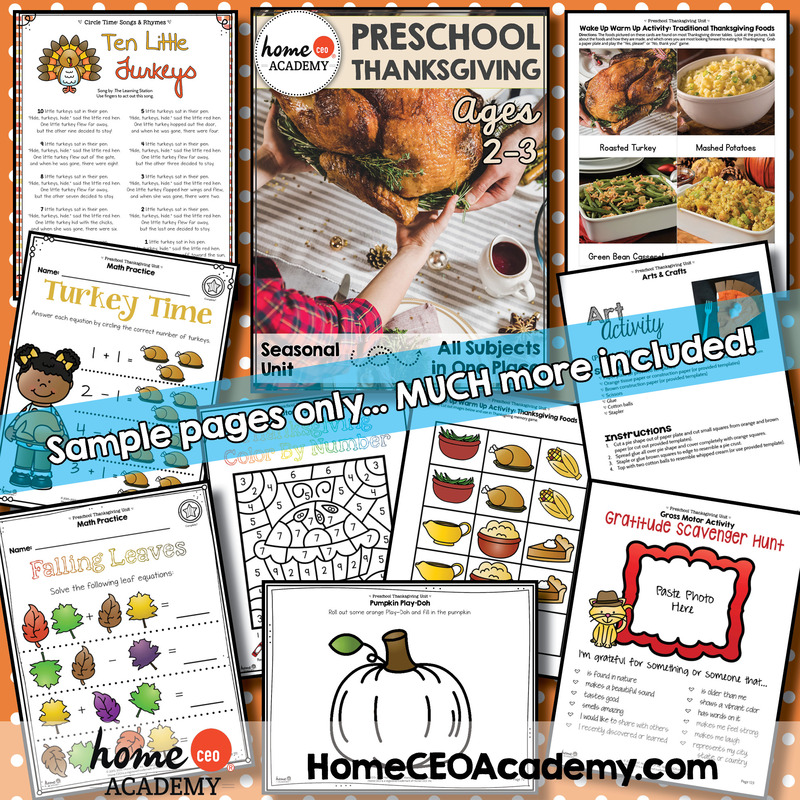 Preschool Thanksgiving lesson plans and 200+ Thanksgiving-themed printable learning, activities and crafts for preschools or homeschools plus additional 200+ pages classroom decor and organization bonuses. Also adaptable for Kindergarten. All profits to charity. Digital product / PDFs. No product is mailed.